Drama and danger abound in this fantasy realm where dukes play a game for the throne, magical warriors race to find the missing heir, and romance blossoms where it is least expected. In a world where dukes plot their way to the throne, a Performer’s life can get tricky. And in Johanna Von Arlo’s case, it can be fatal. Expelled from her troupe after her father’s death, Johanna is forced to work for the handsome Lord Rafael DeSilva. Too bad they don’t get along. But while Johanna’s father’s death was deemed an accident, the Keepers aren’t so sure. The Keepers, a race of people with magical abilities, are on a quest to find the princess—the same princess who is supposed to be dead and whose throne the dukes are fighting over. But they aren’t the only ones looking for her. And in the wake of their search, murdered girls keep turning up—girls who look exactly like the princess, and exactly like Johanna. With dukes, Keepers, and a killer all after the princess, Johanna finds herself caught up in political machinations for the throne, threats on her life, and an unexpected romance that could change everything. First Line:"Johanna could feel it." 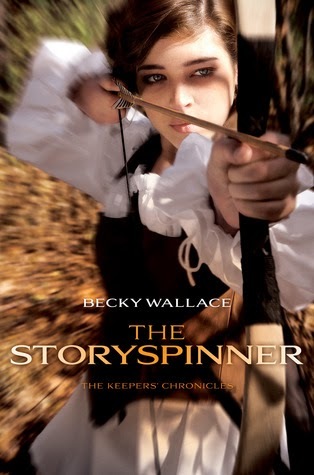 Review: I love fantasy so when I got the chance to get my hands on The Storyspinner I jumped on it and I was not disappointed. It did take me a good minute to really get into the book I think it wasn't until I got to about the thirty percent mark before I couldn't tear myself away from it and it's not that it was slow or boring but the book has several point of views and even though all the point of views were interesting it took me longer to connect with the characters. One thing I was happy about was that even though there are quite a few point of views it only followed two plot lines and by the end of the book it all comes together. I really loved Johanna and Rafi's point of view more then any of the other characters. Their story line was the most interesting to me. These two met under pretty horrible circumstances but it was so much fun seeing the two slowly come around and go from hating each other to tolerating each other to eventually more. They both were very well developed and had many layers to them and I can't wait to see more of them in the next book. The book also followed the Keepers. We had three different point of views from that end and each one played an important role in helping us understand the world they came from and their magic. My favorite out of them had to be Pira and Leao they actually had their own little romance developing which was fun to read about since they started off not really liking each other very much either. The Storyspinner definitely had it's share of deaths. Wallace is one of those authors that is not afraid to kill off characters and out of all of the murders there was one that even now I'm just so shocked...like did she really just kill them off...needless to say it's pretty gut wrenching and you really feel for the one person who was the most affected by it in the book. Overall The Storyspinner had a little bit of everything that really makes me fall in love with a novel and I can't wait for the next book. ~"You are so much more than just a Performer." ~"Whenever you're around, I seem destined for injury."